There is currently a war being waged in the NFL between the running back position and the analytics crowd. Many claim the position is devalued now that the pass has become the most efficient way to move the ball and score points. Offering a RB a luxurious contract extension or using a high selection on a RB in the NFL Draft are often met with outrage due to the nature of the NFL’s salary cap and the implications an expensive RB can have on the construction of a team’s roster. Generally, I align with this line of thinking. However, there are always exceptions to the rules we strictly, and sometimes blindly, adhere to. Context always needs to be taken into consideration. A majority of teams in the NFL employ a running back by committee approach to piece together their rushing attack without having to spend a significant portion of cap space on a single player. This approach usually consists of a backfield utilizing a power back for short yardage/goal line situations and a quick/shifty receiver type back for use on third downs. New England has constructed their backfield like this for the better part of the last two decades. In recent seasons, the Patriots have deployed inside pounders like Legarrette Blount and Mike Gillislee in combination with quick/shifty/receiving backs like Dion Lewis, Rex Burkhead and James White to catch the ball out of the backfield. This approach is effective, but there are contextual advantages to the opposite approach – which is to employ a bell cow running back to take a bulk share of the carries. The “bell cow strategy” allows for more deceptiveness, as it doesn’t signal to the defense what play an offense is going to call prior to the snap. Today’s elite running backs – Le’Veon Bell, Ezekiel Elliott, David Johnson, and Todd Gurley – are a threat to be given the ball as a runner or be targeted as a receiver out of the backfield, a schematic advantage that the RB by committee approach doesn’t allow for. Bell, Elliott, Johnson, and Gurley are simply more valuable than their peers because of how they impact both the run and pass games for their offense. Gurley and Bell ranked 1st and 2nd, respectively, in yards from scrimmage in 2017. Elliott ranked 10th despite missing six games due to suspension. Johnson suffered an injury during Week 1 of 2017 that caused him to miss the entire season, but he and Elliott led the NFL in scrimmage yards in 2016 with Bell sliding in at 3rd. Elite running backs deserve to be fairly compensated for their production. Yet, with the heightened risk of injury and steep age decline due to the nature of the position, teams can be frugal in negotiations with RBs which leads to standoffs like we’ve seen between the Pittsburgh Steelers and Le’Veon Bell. Researching for this piece I analyzed RB age curves and attempted to create my own by charting a sample of RB’s production at different ages. After averaging the production for RBs of different ages I began to realize no significant decline was occurring and that the sample reduced as the age of the RB increased. The reason for the decline for RBs not being as dramatic as advertised was due to survivorship bias – a type of selection bias that focuses on those who survived and overlooks those who died off. As that relates to RBs, the best RBs were mainly represented in the sample because they were good enough to make it to the later stages of their careers. The other RBs ‘died off’ because of injury, dramatic loss of skill, or influx of younger and cheaper talent, thus not being represented in the age curve and leading to the reduced sample. According to Adam Harstad, a better way to conceptually think about player aging is through mortality tables, a method used by life insurance companies to measure risks to help turn a profit, as mortality tables do a good job of “sidestepping” survivorship bias. Harstad, examined 30 years of NFL history to study aging in the NFL, and concluded that while RBs do see a small decline as they get older, they are better categorized as ‘surviving’ or ‘dying’ from season to season. Essentially, RBs hint at decline, but they often dramatically fall off a cliff one year to the next rather than steadily declining throughout the later years of their careers. It’s often assumed that RBs are going to automatically start steadily declining around the ages of 26 or 27. However, as Harstad points out – that’s simply not how the aging process operates. An age curve implies that we can predict individuals decline over the course of several years, but a mortality table fundamentality lays out the probabilities of how likely a player will reach a certain age based on his current age with his production remaining unaffected. Here’s Adam Harstad’s excellent piece on mortality tables in its entirety. So, let’s examine the Le’Veon Bell situation using the mortality table approach – here’s the RB mortality table piece by Harstad. To summarize, Bell has been franchised by Pittsburgh the last two off-seasons and was recently offered a 5 year $70 million contract with the first two seasons paying out $33 million guaranteed. The exact details of the contract offer are not available, but I assume Bell was not happy with the guaranteed money as the contract progressed into the later years of the deal. Bell rejecting the offer almost certainly indicates that 2018 will be his last season as a Steeler. He’s currently entering his age 26 season, which is around the time a RB may begin to show signs of decline. Yet, barring injury, a RB of Bell’s caliber should produce later into his 20’s than the average NFL RB. 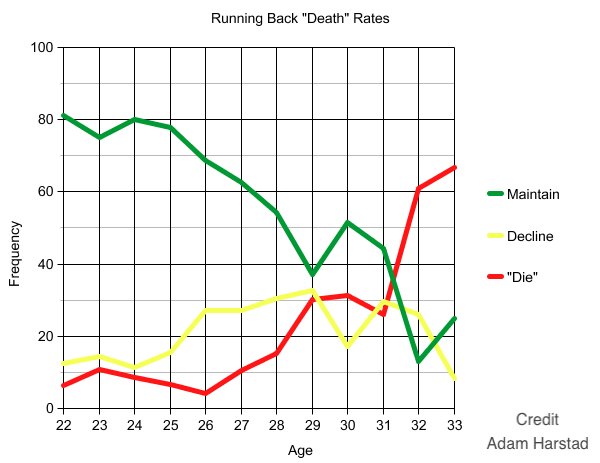 According to Harstad’s mortality table, a RB like Bell in his age 26 season has an Expected Years Remaining (or EYR) of 3.24 with a Death Rate (or DR%) of 11.9%. This doesn’t mean that individually Bell himself has approximately 3 seasons of play left with a 11.9% chance of falling off a cliff this season. The mortality table represents a pattern from a pool of players similar to Bell to measure and categorize risks involved. With that being said, a player like Bell is deserving of a second contract, and that holds more weight in regards to the EYR outlined by the model. Now, it’s also important to note that the table is riskier for RBs since the slight decline of RBs was not accounted for in Harstad’s model. Using the table to measure the risk of extending a 26 year old RB, we can determine that the Steelers are potentially losing out on three quality seasons from Bell because of their inability to construct a contract during the last three off-seasons that benefits both the player and organization. Playing it season to season like Pittsburgh did works financially, but it isn’t the optimal strategy to retain the final prime seasons of an elite RB’s career. 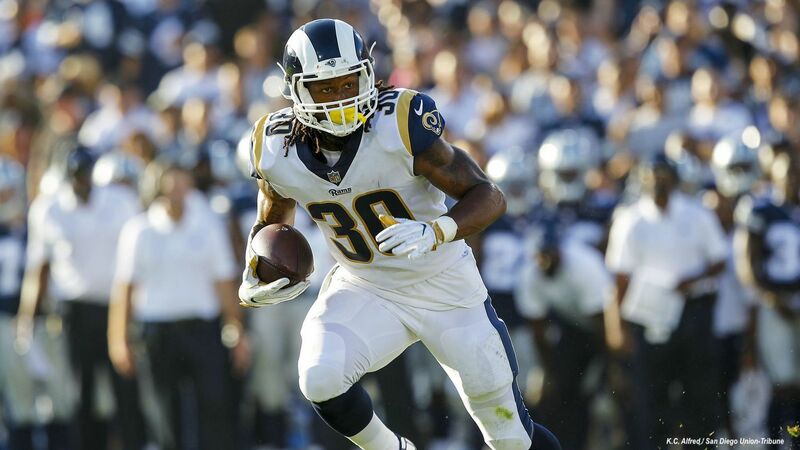 There was no current blueprint for organizations to go by to wisely extend their franchise RBs until the Los Angeles Rams and Todd Gurley agreed on an innovative 4 year, $57.5 million extension with $21.95 million fully guaranteed at signing according to Pro Football Talk. The deal is magnificently structured for both the team and the player, leaving everyone involved pleased. Pro Football Talk lays out the cash flow of the first four seasons, stating that Gurley will earn $21.95 million in his first year, $26.95 million through two years, $39.5 million through three years, and $49.5 million through four years. That is $12.2 million more than the $37.3 million Gurley would have earned by playing out his rookie contract for two more seasons and being franchised for the following two seasons. The Rams are protected, however, by guaranteeing Gurley’s salary and bonuses after the third day of the league year in 2019 and 2020 should he succumb to injury or a drop-off in talent. Cutting him before the 3rd day of the new league year in 2019 would essentially make the deal a one year, $21.95 million deal. Cutting him before the third day of the new league year in 2020 would result in paying him $34.5 million for two seasons. In 2021, Gurley’s roster bonus becomes fully guaranteed on the 3rd day of the new league year or the first game, whichever comes first due to potential work stoppages with the CBA set to expire. Unless some drastic decline to Gurley’s performance happens within the next four seasons, the team’s best out to avoid dead money is in 2022 when designating Gurley as a post-June 1st cut would result in $4.2 in dead money and $10 million in savings. Based on Gurley’s draft position, traits, and production through three seasons in the NFL we can make the assumption that he fits the mold of a quality back that can survive into his late 20s. According to the mortality table a player like Gurley entering his age 24 season has an EYR of 4.49 with a DR% of 7.2%. This is where the Rams $12.2 million bet could pay off for the team down the road. Los Angeles will pay more upfront now and have him for those two extra seasons instead of letting him go in the midst of his prime. Should the deal not pan out, well, the thought process behind the strategy was sound. Trust the process as they say. The deal is structured very similarly to an MLB organization buying out a player’s arbitration years and first few eligible years of free agency. Note – a MLB player with less than six years of service time accumulated is not eligible for unrestricted free agency and goes through an arbitration process to determine annual salaries unless the player and team settle on an agreement without an arbitrator. The central idea behind this move is that the team pays more now and locks the player in for a good part of his prime. This allows the organization to keep the average annual cost down in the future when the player is eligible to become a free agent during his prime seasons where he’s likely to command more money annually. The player then benefits from financial security earlier in his career should he be injured or decline in skill level instead of holding out for a larger payday down the road. More teams should begin to model contracts like the Gurley deal for RBs rather than play it season to season with the franchise tag. There is still value to extract from top tier RB’s prime seasons after their rookie contract expires followed by a season or two on the franchise tag. Waiting until a player is franchised might be too late to structure this sort of deal. By then a player may rather test the open market because they’ve survived the risks of playing year to year. A deal that offers financial security at this point in a player’s career can now be offered by all 32 teams, not only the team that drafted a player. Which is what we’ve seen take place with Le’Veon Bell should he escape 2018 injury free. Los Angeles may have changed the RB market in how franchises think about structuring extensions for their elite running backs. With back to back loaded RB drafts it’s easy to imagine that organizations with young talented RBs will be looking to replicate the Todd Gurley deal to maintain their franchise RB’s prime seasons.